To celebrate the launch of a couple new retro arcade skins, the League of Legends team have released a similarly old-school pixel art wallpaper of Summoner’s Rift. There’s a lot going on in the image, though, and apparently a bunch of surprises, too. When we think back to 80s and 90s gaming, we think secret levels, Easter eggs and fun hidden all over the place, so that’s what we wanted in an 8-bit Summoner’s Rift. Scratch the surface and you'll see adorable pixel minions traipse up and down the lanes among giant retro towers. Raptors, Krugs and Bramblebacks are all gloriously stylised. Even the dragon and Baron Nashor are getting in on the action…Keep an eye out for more secrets hidden around the map. That last sentence has kicked off a rabid search to discover said secrets. 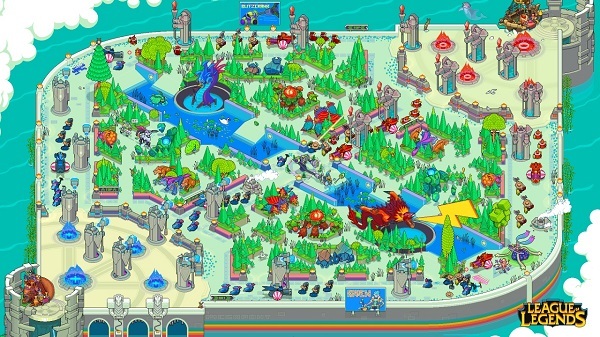 From the League of Legends forums to various posts popping up all over the internet, dedicated fans are trying to figure out what hidden messages might be peppered throughout the bright and colorful look at Summoner’s Rift. The general consensus seems to be that we may be looking at hints as to which characters are next up for a retro skin remake, though the LoL squad isn’t saying a peep. Even if you’re not into the whole rumor and speculation thing, there’s still plenty of fun to be had here for League fans. Megapont.ru’s map is fun to explore, and you’re likely to find a familiar face or two along the way. As a matter of fact, the original post also includes links to wallpapers of the image in various sizes, so you can use it to deck out your own computer, tablet or phone (though you’ll have to squint reeeeeeally hard to see anything on that tiny screen). If, however, you happen to be a fan of Where’s Waldo-esque puzzles, then you’ll definitely want to check out the comments section for the original post. People have done quite a bit of digging and are having lively discussions about what they see, what they think they see, and what those things might mean for League of Legends. If you’ve got your own theories, feel free to include them in the comments section below.